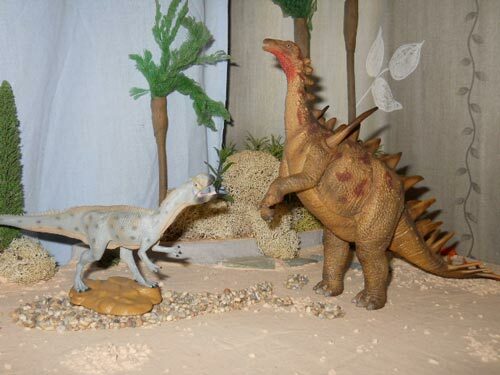 Our thanks to Robert Townsend who sent us some more prehistoric animal diorama pictures. This time, Robert focuses on dinosaurs that lived in Europe during the Jurassic and he has created some fascinating scenes in his large-scale dinosaur diorama “The Lost World”. This is a nicely composed shot, the details on the foreground are clearly defined and the whole photograph has a sense of perspective. CollectA Lourinhanosaurus in a dinosaur diorama. The Lourinhanosaurus model is part of the “Prehistoric Life” model range by CollectA. In this image, Robert brings out the detail on the figure quite nicely as well as revealing the level of care taken in the creation of the prehistoric scene, note the tiny pebbles in the foreground. Clearly a lot of time and effort has gone into creating the prehistoric settings for these dinosaur models. A number of environments are depicted in the dinosaur themed diorama, the use of water effects provides a good focal point to set various prehistoric scenes. The low light in the background gives the impression of dusk, here is a Metriacanthosaurus (model by CollectA), coming down to the river late at night to quench its thirst. A CollectA Metriacanthosaurus threatens a CollectA Dacentrurus dinosaur model. Robert is keen to depict various interactions between prehistoric animals associated with Jurassic-aged strata from Europe. In this photograph, an adult Dacentrurus adopts a threatening posture when confronted with a Metriacanthosaurus. The meat-eater better watch-out, as at nearly two tonnes, the Dacentrurus is a very formidable opponent. Our thanks to Robert for sending in these photographs. We get sent lots of pictures and other dinosaur related items, we enjoy looking at them all. We really do enjoy the creative ways in which our customers display their dinosaur and prehistoric animal model collections.